Sign Banners Are Powerful And Economical For Your Business! CUSTOM BANNERS...Get the information you need! Banners are a powerful, yet economical, way to bring attention to your business, project or special event. You can reach thousands of viewers with banners made in our state-of-the-art facility. Whether you need a single banner or a thousand, we can produce your order. We have no size or quantity restrictions. 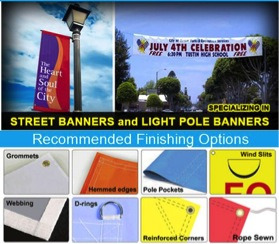 We can fabricate your banners utilizing one or more of the following production methods. We carry an extensive inventory of substrates and will assist you in choosing the most suitable material for your project. Banner StandsOur premiere indoor/outdoor banner stands are portable, lightweight, and available with a special carrying case. The premiere stands are adjustable up to 10' wide and 10' high. Looking For Decals? Any Size and Any Kind of Decals........you need! Looking For Decals? 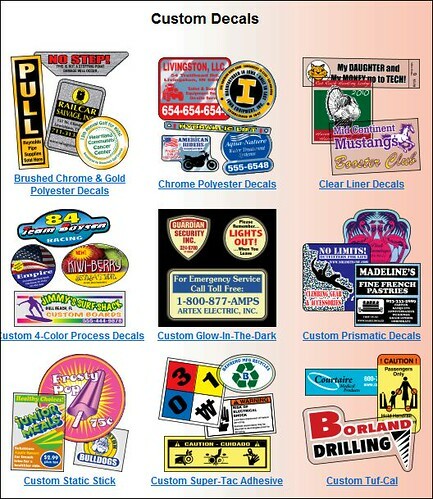 Any Size and Any Kind of Decals..........you need! The Sign Studio's cutting-edge technology enables us to recreate just about anything, including logos, landscapes and even your own children in virtually any shape, size, or quantity you desire. Using a variety of materials, including high-grade vinyl, our products stand the test of time. Our custom labels and decals look beautiful when applied correctly, and our wall murals and wall graphics actually look more like professionally painted artwork than a sticker or decal. They can hold up beautifully for years under normal traffic without significant fading, bleeding, peeling or cracking. Trade Show Season Time Again? 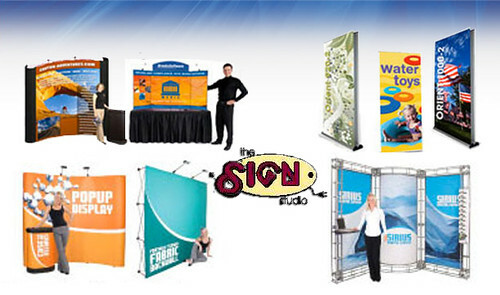 Do You Need Trade Show Signage? Our trade show display products get your company noticed and give you the critical edge over your competition. Drive more traffic to your trade show space or POP displays with one of our powerful, custom-designed display solutions. Each of our full-color displays is designed for maximum visibility, flexibility, and portability. 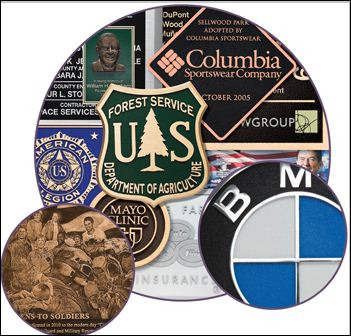 Special lamination is applied to your booth or display so graphics can be rolled up for easy transport. and will still always hang flat. We are experts in the creation of trade show exhibits, displays and booth visuals. A trade show display or exhibit rental can be a convenient alternative to purchasing a trade show exhibit. It allows you the impact of having a customized trade show display and flexibility of not having to commit to a specific format. It is a great idea if you are interested in testing different sizes, or if you are not sure that a pop-up display is right for you. For more ideas, please see our Tradeshow Catalog. Are You Looking For Outdoor Sign Ideas? Get perfect outdoor sign solutions produced with high-quality processes and materials by The Sign Studio experts based in Burbank/Los Angeles, CA. We specialize and serve the Los Angeles and Orange County, CA and surrounding areas. At The Sign Studio, our outdoor signs are designed with attention to detail, state-of-the-art technology and high-impact visuals. We provide quality, commercial electrical and non-electrical outdoor signage in a cost-effective and timely manner, at sign prices that are always competitive. Most of all, we guarantee you will be excited about the finished product. • The large format digital printing technology we employ allows for extended creativity and provides bold, bright colors and dramatic images viewable from far away. • The current imaging technology provides stunning displays that were not possible by hand-painting, and new display techniques allow for even greater creativity that cannot be executed in other media. • Outdoor has a naturally large audience. Outdoor displays grab people's attention while they drive or walk. • Efficiency is paramount in outdoor advertising. Due to its relatively low cost and extremely high audience, the cost per thousand impressions is substantially lower than radio, TV, and print media. • Outdoor advertising is an excellent way to remind the audience of your product and strengthen brand awareness. Outdoor is the link between in-home advertising and the point of purchase. Yard Signs, Sidewalk Signs and Coroplast Signs - Marketing Ideas! Outdoor advertising is an excellent way to remind the audience of your product and strengthen brand awareness. Outdoor is the link between in-home advertising and the point of purchase. Yard signs are attractive and colorful, and serve as the ideal visual solution for advertising all types of sales, events, openings and much more. Yard signs allow you to advertise your work to larger outdoor audiences by, for instance, placing a sign at an unfinished construction site, or a visual progress "log" at a place where project development work is still ongoing. As additional advertising for your business, yard signs also allow you to, for example, ‘sign your name' to a particular service you are performing as a contractor at a given client site. In the real estate industry, curbside yard signs help in promoting the attributes of properties given out for rent, or being put on the market for purchase. You can make use of small directional yard signs that easily point the way to new commercial and residential developments. Cost-effective and informative, outdoor yard signs are a great way to get information to your potential customers quickly, and to establish a company identity through consistent use of your logo, "company colors" and other design elements. Yard signs are available in all shapes and sizes to fit your specific requirements. If you have any questions or need further information, please give us a call at THE SIGN STUDIO (818) 843-9200 or send us an e-mail at info@signstudiola.com. How Effective Signs, Posters and Banners Can Be For You! At The Sign Studio, we can help you design and print the perfect indoor or outdoor signs, posters, banners, charts, or oversized photos to grab your audience's attention and communicate your message loud and clear. Large, eye-catching signs, posters, banners and displays appeal to customers and deliver your message more effectively. Signs, posters and banners can help you build brand awareness and brand loyalty, generate leads and retain customers. Whether you're a retail store, small business, or corporate marketing, training or human resources department, we can help you with sales promotions, window and store signs, presentation support, or trade show and event marketing. Like everything we do at The Sign Studio, we use the latest equipment for the sharpest resolution in black and white or color to create the greatest impact, giving you the greatest return on your investment. To customize your message, you can choose from an almost endless selection of sizes, and print on paper, cloth, vinyl, canvas, or any number of other materials. We even laminate, mount, add grommets or help you with any other type of hanging or assembly. Have a big idea, or need us to help you with one? It's easy to make a big impression with signs, posters and banners by The Sign Studio! If you have any further questions or need any help, please give us a call at (818) 843-9200 or send us an e-mail at info@signstudiola.com. Are You Looking For Coroplast Signs Or Yard Signs To Advertise With? 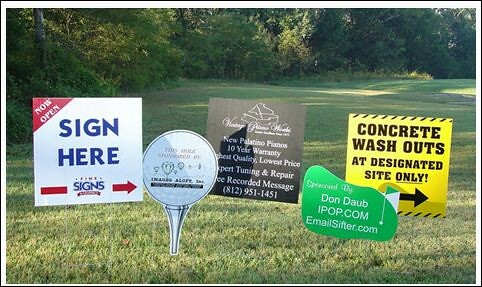 Use yard and site signs to draw potential customers to your properties and let passersby know who is working on site. From small identification signs to large leasing signs, yard and site signs attract attention and generate interest in your properties and services. Effective and affordable, yard and site signs get your message out. Put your name and company logo in front of prospective customers with impressive yard signs. Available from THE SIGN STUDIO in a range of custom and standard shapes and sizes, yard signs point the way to new real estate developments, promote events and specials, and identify the type of work being done on a property. Whatever your objective, professional yard signs provide the visibility you need to deliver your message quickly and affordably. • Offer properties or products for sale or lease. • Promote a candidate or campaign. • "Sign your name" on a project. If you have any questions or need any further information, please call The Sign Studio at (818) 843-9200 or send us an e-mail at info@signstudiola.com. Site Signs are ideal for many uses! Use yard and site signs to draw potential customers to your properties and let passersby know who is working on the site. From small identification signs to large leasing signs, yard and site signs attract attention and generate interest in your properties and services. Effective and affordable, yard and site signs get your message out. Generate awareness and create interest for your properties with on-site signs. Ideal for construction sites or commercial businesses, large site signs colorfully convey your message and provide availability information so your prospective tenants or purchasers have all the information they need. • Show off your property before or after construction. • Sell or lease space. • Direct customers to your sales office. • Show prospects what the end result will look like. If you have any questions or need further information, please call The Sign Studio at (818) 843-9200 or send us an e-mail at info@signstudiola.com. Make a bright and colorful impression with illuminated signs. 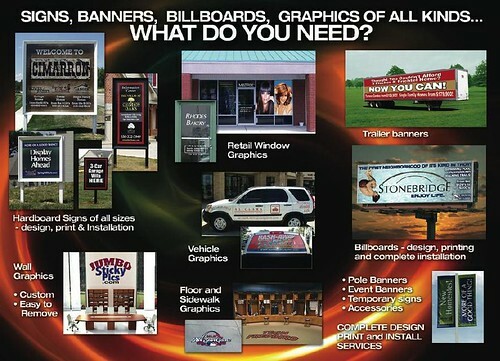 THE SIGN STUDIO offers a wide range of options to fit your needs. From sign cabinets and channel letters to custom backlit signage and digital LED displays, we have everything you need to increase your visibility and attract customers, day or night. Put your message in the best light with backlit displays. THE SIGN STUDIO'S backlit displays make your advertising and informational messages readable in any setting and any lighting. Backlit display signs are made using a variety of colors and lighting techniques to creatively display your logo and message-for signs that get attention day and night. If you have any questions or need further information, please give us a call at (818) 843-9200 or send us an e-mail at info@signstudiola.com. business sign, a commercial site cannot function at its full economic potential. - using signage to change customer behaviors. careful attention as these other components. message, or get the clientele it seeks. How do you know if your sign is (or is not) branding your site for future reference by potential customers? and trade associations will assist in compiling data. is not working, and increase what is working. The importance of signage to mobile consumers is underlined by the fact that many are in a hurry. By way of example, Burger King Corporation conducted a survey over several weeks. The survey results were part of evidence submitted in a legal action brought by Burger King (among others) against Agoura Hills, California, to prevent the removal of its freeway-oriented, high rise on-premise sign as required under a new sign code. The Burger King sign was visible to the Ventura Freeway; the building was not. participants were asked how they first became aware of the restaurant. Here are the results. How did you first become aware of this restaurant? particularly advertising in the form of on-premise signage. Burger King and its co-plaintiffs won the lawsuit, and the City was permanently enjoined from enforcing its high-rise pole sign ban against them. (See, Denny's Inc., et.al. v. City of Agoura Hills, 56 Cal.App. 4th 1312, 66 Cal. Rptr 2d 382 (1997)). "pass-by trip"; for our purposes, it is defined as an "impulse" stop. destination. The table demonstrates that impulse trade is very important to many businesses. Effective onpremise communication can help persuade passersby to stop and shop. local shopkeeper to compete, even with the mass merchandiser or large retailer. study group with annual sales of $500,000. additional 144-square-foot pole sign added $0.78 per transaction. 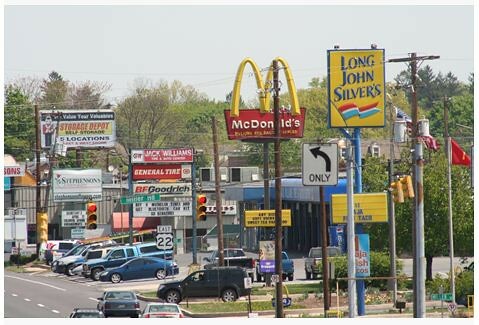 the effects of modifications, additions, or removal of on-premise signage on sales performance. signage (generally, with larger signs) resulted in an average revenue increase of 5%. new signs' enhancement of site visibility to passing traffic. shopper more than any specific advertising effect. specific site, especially given that normal profits in the retail industry are approximately 1-2%. research results and articles (e.g., sign amortization; copyright and trademark protection.) The booklet was published jointly in 1997 by CESA and ISA. increase purchases within discrete segments of the market by introducing "intervening opportunities"
It is estimated that 35-50 percent of the consumer population today shops outside their local area. higher the return on advertising dollars. Like real estate, signage has a value that can actually be measured or appraised. The visibility component to a real estate site typically encompasses more than the traditional sign out front. How is an appraisal of a sign done? is the common measure of value in building or home appraisals. varying ability to be seen via the passing traffic may also be analyzed. commercial speech. Additionally signs are relied upon and used by consumers to make and influence their shopping and purchasing decisions. communicate as it's meant to (i.e., is clearly visible, legible and understandable by the intended audience). Sign Maintenance and HOW IMPORTANT it really is! Signage is the single, largest promotional tool you have. It is your way of saying to the public, "Hey! We're open for business and here to serve." Nice job! You've reminded your current customers that you are here ready to take care of their next need and you've introduced your business to future customers. But what if your sign is in disrepair? What if the lights in and around your sign are out or the face is broken or dirty. Worse yet, what if it is outdated? Now what kind of impression or message are you communicating? It still reads "Hey - pick me" but it consciously and subconsciously causes your customers to read between the lines . . .
. . . and what they're reading isn't good! It's saying, "maintenance and upkeep isn't a priority for this business and neither is quality or cleanliness." "If they care so little about their business, how could they possibly care about me, their customer?" What your sign has done is effectively set a negative expectation of your business in the mind of your customer. Your unkept sign defeated the very purpose for which it was intended. Upkeep and freshening of your signage and lighting shouldn't be an afterthought; it should be a priority . . . protect your marketing investment and allow your signage to do what you intended - work for your business, not against it! Something else to consider: On average, 46% of first-time customers find your business as a result of your sign. What would a 5 or 10% drop in sales mean to your bottom line simply because your sign was in disrepair or out of date? Sign Maintenance is another area in which our personnel excel. Our 24/7 service department is on call and ready to serve your sign needs. From storm damage to national maintenance support to routine lamp outages, we have the parts, personnel, and knowledge on hand to make sure your sign maintenance needs are addressed in a timely fashion. Do You Or Any of Your Signs Need a Makeover? Be Honest! Your signs say a lot about who you are and what you do. 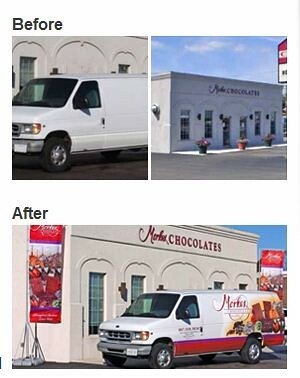 That's why it's critical that you display the right signs and graphics for your business, event or organization. 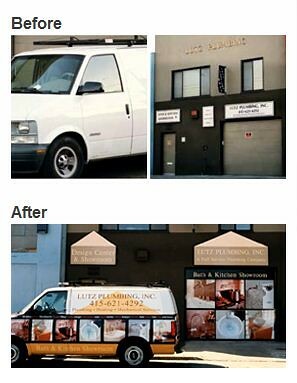 Sign makeovers from The Sign Studio can help make a big difference in your success. Whether you want a few simple updates, or are in need of a complete sign and graphics makeover, we work with you to understand your specific sign needs. THE SIGN STUDIO makes it simple for you to bring your creative ideas to life or, we can design something customized to your specifications. Do You Need to Refurbish or Evaluate Your Signs? It's Time to Evaluate Your Signage! • Do you look open for business? • Is your sign easy to read and spot from the road? • What type of business are you? • Is your business thriving? A little cosmetic work can refresh your business. A decaying or fading sign reflects poorly upon a business. First impressions are key and you only have one opportunity to make them. Have you considered a sign face lift? The Sign Studio will work within your budget to help you form the identity you're looking for. Don't go another day without signage, or a sign face lift! Sign Variance and Sign Permits - Do You Need A Sign Variance? Do You Need Or Want A Sign Variance? SIGN VARIANCE - What is that? Why do I need a Sign Variance? 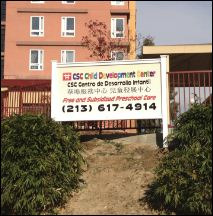 It is important to work with your sign professional and local zoning department when designing your business signage. 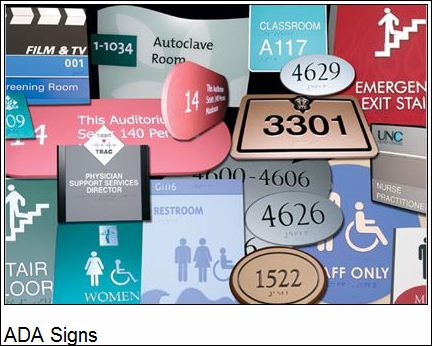 A quick check on the zoning/building code will give you a guideline to use when developing your signage. Sign variances become necessary when unique circumstances exist for a property that do not allow for adequate identification of the business. Most sign variances are requested for the purpose of exceeding a municipality's square footage or setback allowances. A quasi-judicial board of elected community members will hear your case and make a decision based on the characteristics of your specific request. Many communities request that you consider and provide answers to the Duncan Factors (used for consideration of area requests). 1). Will the property provide a reasonable return without the variance? 2). Is the variance substantial? 3). Will the surrounding properties be adversely effected by the variance? 4). Will the variance inhibit government services (fire, police, ems)? 5). Is the hardship self-inflicted? 6). Is there a reasonable alternative to this variance? If you have any further questions or need any information, please contact The Sign Studio at (818) 843-9200 or send us an e-mail at thesignstudio@sbcglobal.net. Make Sure Your New Electrical Sign Is UL Approved to Specifications. 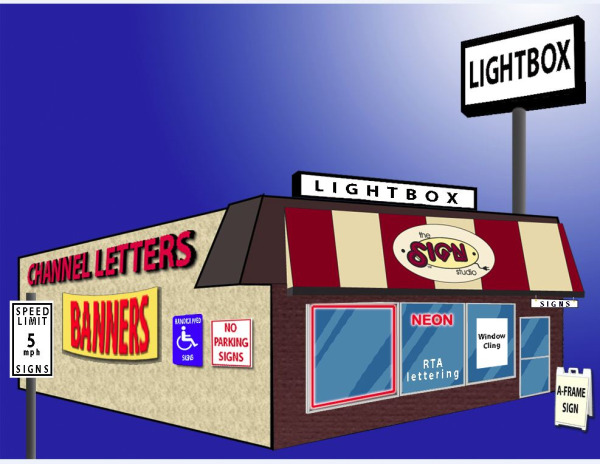 Illuminated Store Front Channel Letters May Look Alike But Do You Know What You Are Getting? 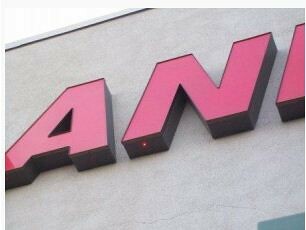 Illuminated store front Channel Letters may look alike but do you know what you are really getting? At The Sign Studio each channel letter is fabricated to UL specifications. Why is this important? 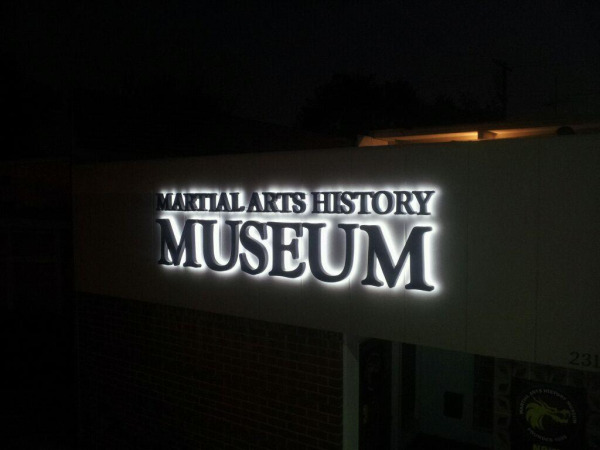 Simple, it assures the customer their illuminated 3D letter above their store front is safe and built to last. Drive around at night, see burned out signage, flickering neon and broken plexi faces. The average customer is unaware what they are truly getting for the price they are being quoted, after-all all letters appear to look the same from the outside when first installed BUT the big difference is the way in which the sign letters are manufactured. What materials will be used in the fabrication of your electrical sign letter? The Sign Studio uses heavy gauge aluminum where some competitors use cheap paint lock metal which start to rust the day it goes up ( ever see brown rusty streaks coming off a letter on the building? that's paint lock metal ), secondly what thickness is the acrylic pan channel letter face? Thin sheets of plastic are half the price of standard but one may not tell until the weather changes because plexi expands and contracts as climates get colder or hotter thus cheap plastic faces crack quick. What about the lighting ? Is it 2 rows of 12mm Neon or 1 row of 8 mm Neon? What about the transformers, are they used or rebuilt? Even wiring cost differ greatly. Thus next time you are in the market for Channel Letters, whether plastic faces, led lit, Open Face Neon or even Halo reverse lit, it is always good to ask if your getting UL letters. Look for the sticker (is it real), ask the shop for their UL number and always be suspicious of low prices. You may find your sign letters look good the first few weeks but when costly service calls happen your original cost rise fast, so when you are looking to get your business name in lights, contact The Sign Studio at (818) 843-9200 or send us an e-mail at thesignstudio@sbcglobal.net. Are Blade Signs The Right Kind Of Sign For You and Your Business? What are Blade Signs ? Blade signs are often used when you're looking to attract pedestrians or drivers who don't see your storefront because they are traveling perpendicular to the front of your business. So while they may not be able to see your front sign, they will see your blade sign. Blade signs are often illuminated both on the front and back with 2 faces, however they also hang from a variety of different brackets with a cut-out design. Our custom-made blade signs and bracket solutions are eye catching and built/constructed to withstand all the elements. The Sign Studio uses top grade materials. There are so many variations in materials and colors, as well as mounting options. Single or double-sided, illuminated or non-illuminated, our blades are engineered to project your message and grab the attention of pedestrian and passerbys. If you have any questions, please give us a call at The Sign Studio 818-843-9200 or send us an e-mail at thesignstudio@sbcglobal.net. Retractable Banner Stands with a 5 Year Warranty - Can You Bet That? Stand out at your next trade show or event with retractable banners from THE SIGN STUDIO! Our retractable banner stands are an easy, cost-effective promotional solution. All of our retractable banner displays are constructed in eco-friendly facilities and are even recyclable once they've reached the end of their life. THE SIGN STUDIO offers several banner stand models in both standard and economy categories to suit your needs and wallet! 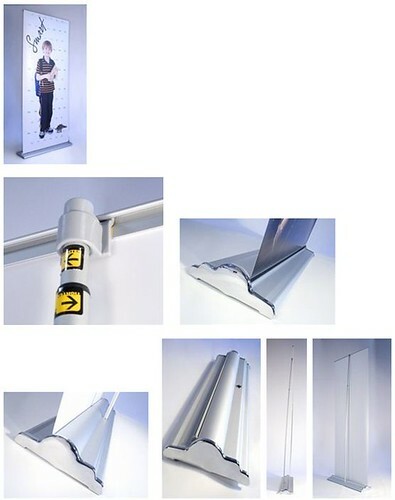 The best thing, all our retractable banners stands come with a 5 year warranty!!!! Our economy line of retractable banner stands are a low-cost alternative to our standard roll up banner stands. THE SIGN STUDIO's economy models are functional and reliable, but use lighter weight materials and simpler construction to save you money. 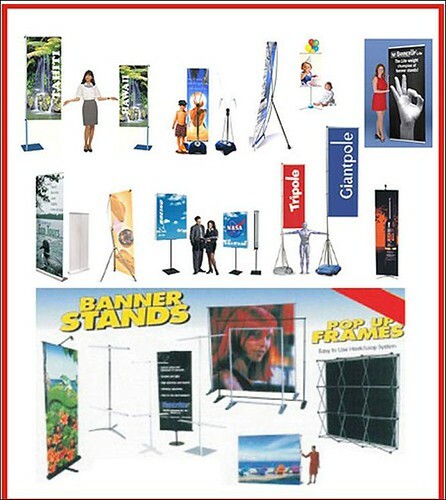 These portable banner stands are produced by a handful of independent retractable banner and display producers from all across Asia. 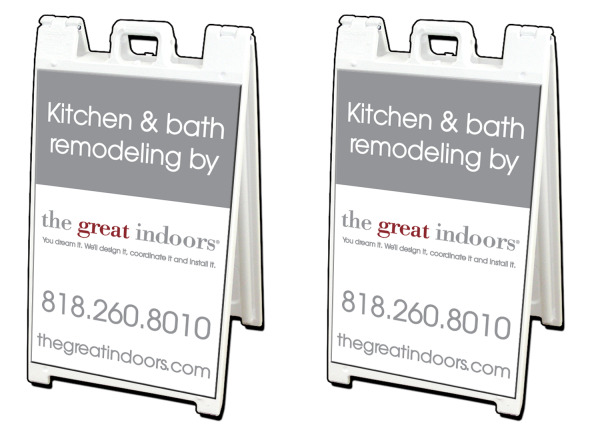 Two economy models are available to fit your needs and your budget: our single-sided model measures 31 inches wide and 77.5 inches tall, while our double-sided retractable banner is 32.75 inches wide and 78.25 inches tall. If you need help with your graphics, let the experts at THE SIGN STUDIO design it for your, just sit back and wait for your layouts to review via e-mail. It's that simple! If you have any further questions or need more information, please call us at (818) 843-9200 or send us an e-mail at thesignstudio@sbcglobal.net. Signs Are Your Marketing and Advertising Tool! Let's discuss what signage can do for your business, and how signs can be used to your advantage. - Signs perform three major communications functions for your business; they give information and direction, provide a format for street advertising, and build your image. - Signs Give Information About Your Business and Direct People to Your Business Location. - Signs index the environment so people can find you. This is especially true for travelers, new members of your community, and impulse shoppers who may be on a journey to purchase a particular good or service which you sell. Americans are mobile. Each year 40 million of us travel over 1.7 trillion miles by automobile and approximately 19 per cent of us change our place of residence. A primary source of customers for your business is the large number of people who are new to your community or who may be just passing through. Your sign is the most effective way of reaching this mobile or transient group of potential customer. - Signs can correct a poor location by substituting effective communication for poor site characteristics. If your business is located on a site which is not visible or in a building which does not correspond with the goods or services offered, your sign can overcome this disability. For example, most buildings are not built to conform to the design needs of any particular type of tenant. Without an effective sign it is often impossible to determine what type of business is being conducted in a given building. In addition, when your site is located off a busy traffic artery or in an area which is not easily accessible your sign can communicate to people who are passing on a busy street several blocks away. If you are located off a busy freeway but far from an exit, your sign becomes your main device for directing people to your business. High-rise signs are used when a business is located away from potential customers' normal pathways of travel. Street advertising also helps people develop a memory of your business name and the products and services you sell. People tend to buy from businesses they know. Through materials and design, a sign can appeal to a given group of potential customers. For example, some firms attempt to capture the youth market, others senior citizens, others unmarried single people and so forth. If you have a particular market segment that you wish to attract to your business, your sign can be an important means of bringing these people in. constructed and loaded in accordance with that design." 3. Fall Protection Training - Employers are required to provide a training program for each employee who might be exposed to fall hazards. protection program with required worksite-specific procedures and elements for required respirator use. interrupter equipment or an assured equipment grounding conductor program. operation, ingoing nip points, rotating parts, flying chips and sparks. 10. Electrical Wiring Methods, Components and Equipment - Regulations require that "for temporary wiring over 600v, nominal fencing barriers or their effective means shall be provided to prevent access of other than authorized or qualified personnel. Electrical feeds shall originate in a distribution center. Branch circuits shall originate in a panel board or power outlet. Receptacles shall be of the grounded type and flexible cords shall be protected." LET US DESIGN/FABRICATE AND INSTALL YOUR SIGN WHILE YOU BUILD YOUR BUSINESS!! The clothing of a company! The signs on the outside exterior of any business create a first impression to your employees, customers and visitors. Make sure your signs say the right things about you and give the best first impression they possibly can! The Sign Studio fabricates signs that are used for shop fascias, business signs, industrial signs and more – from complex signs for multisite locations to pavement furniture or temporary signs. The Sign Studio also supplies illuminated signs for maximum night time impact. Fascias show visitors and customers who you are at first glance and give your premises an identity. This is very important as you want to make your first impression stand out. You can brighten up your business and increase your company’s visibility with illuminated signs. Use large, eye-catching signage to draw attention to your commercial units. Easily appointed signs help to navigate people to particular locations. The most commonly used sign systems are post & panel mounted signs which are also very cost-effective for an exterior sign that is used widely across many businesses. The Sign Studio can design and manufacture plaques to suit your needs in all styles and sizes. Portable pavement boards are available in a range of materials and colors, bringing attention to your retail area and advertising promotions. If you have any questions or need further information, please give us a call at (818) 843-9200 or visit our website at www.signstudiola.com – You can also reach us by e-mail at info@signstudiola.com. How Effective Do You Think Your Sign Is? Make Sure Your Sign Is! Your sign is an integral part of your advertising program along with the other forms of commercial communication such as television, radio, newspapers, magazines, and billboards. There are four basic criteria used to judge the effectiveness of these advertising media: (1) coverage of the trade area, (2) repetition of a message, (3) readership of a message, and (4) cost per thousand exposures of a message. Two other criteria important for the small business owner are (5) availability and (6) ease of use. Let's see how signs measure to the above criteria. 1) Signs are oriented to your trade area. Signs do not waste your resources by requiring you to pay for wasted advertising coverage. The people who see your sign are the people who live in your trade area. 2) Signs are always on the job repeating your message to potential customers. Your on-premise sign communicates to potential customers twenty-four hours a day, seven days a week, week after week, month after month, year after year. Every time people pass your business establishment they see your sign. The mere repetition of the message will help them remember your business. 3) Nearly everyone reads signs. Signs are practical to use for nearly everyone is used to looking at signs and using signs, even small children. Studies have shown that people do read and remember what is on signs. When special items are displayed, sales increase for these particular items within the store. 4) Signs are inexpensive. When compared to the cost of advertising in some other media, the on-premise sign is very inexpensive. Table 1 indicates the cost-per-thousand-exposures for various media in a given type of community. Unless your trade area encompasses an entire city or region, where you must rely upon broad based media coverage, there is no better advertising dollar value than your on-premise sign. 5) Signs are available to each and every shop owner. There is no need to schedule the use of your sign. Your sign is available to you whenever you need it and to be used however you please. 6) Signs are easy to use. No special skills or resources are needed to operate a sign once it has been installed. If it is an illuminated sign, all you need to do is flip the switches and that may not be necessary with timing equipment. Once the initial expenditures are made no special resources or professional services are needed. You need only operate and maintain your sign.